The first time we ever remember hearing about steroids, as far as we can recollect, was Canadian sprinter Ben Johnson, a guilty finding made all the more hilarious because he's Canadian. (Kind of.) Well, over the weekend, Johnson revealed that he has finally, 18 years later, figured out who famously doped his pre-race beer the night before the sprint. You'll never guess. Yep ... it's Carl Lewis! 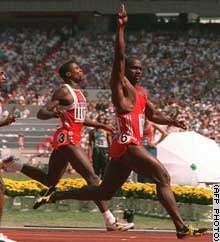 Ben Johnson dramatically alleged superstar Carl Lewis was "involved" in a conspiracy to sabotage the Canadian's drug sample and bring on the biggest scandal in Olympic history. Johnson, who lost the 100m gold medal and world record after failing a drug test at the 1988 Seoul Olympics, said it had taken 18 years but he now knows who spiked his drink. "I have the information on how it was done and why it was done this way and who was behind it," Johnson said yesterday.Asked whether Lewis had anything to do with the alleged sabotage, Johnson replied: "I won't say too much but . . . he's involved." As much as we love the idea that an American football player drugged Ben Johnson's beer in South Korea at the orders of Carl Lewis — how old was Michael Irvin then, anyway? — we must confess considerable skepticism concerning Johnson's story. Now, if the beer-poisoning perp would have been humming some rock show goodness, well, we might be swayed.